When TUNRA Bulk Solids was approached by one of the world’s largest mining corporations to perform comparative testing on conveyor belt samples, it resulted in the development of an innovative Cut & Gouge Tester. Tunra Bulk Solids was approached by one of the world’s largest mining corporations to perform comparative testing on conveyor belt samples from a range of belt suppliers for a global tender. The strategic nature of this project required testing to the highest quality and a solid understanding of relevant belt characteristics and their assessment. There are a range of standardised test methods available, including breaking strength, tensile strength and elongation of cover rubber, erosion and abrasion resistance, hardness and tear resistance tests. During the planning phase a range of these tests were selected for the global tender. A need for testing capability for cut and gouge testing was identified. The cut and gouge test is meant to simulate the impact of sharp objects such as jagged rocks or pieces of metal debris from upstream processes onto a conveyor belt. 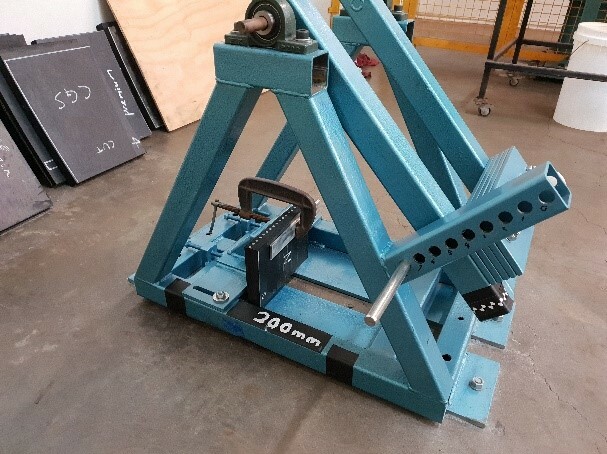 Currently there is no standardised test method available for cut and gouge testing and at the start of the testing campaign, globally there were only two known test rigs available to test cut and gouge resistance. TUNRA Bulk Solids developed a custom cut and gouge test rig tailored to the client’s needs. The following will introduce the TUNRA Cut and Gouge Tester. As shown in Figure 1 and Figure 2, the impact energy is transferred via pendulum motion, where it is the result of the excitation of the pendulum and the impact mass. The stress induced into the rubber samples is a function governed by the shape of the cutting tool (ref. Figure 3) and the elastic and plastic properties of the belt sample. Figure 1: Cut and gouge tester. Figure 2: Schematic of cut and gouge tester. For each cut and gouge test, the resulting depth of the cut and the penetration of the cutting tool past the face of the belt sample were recorded. 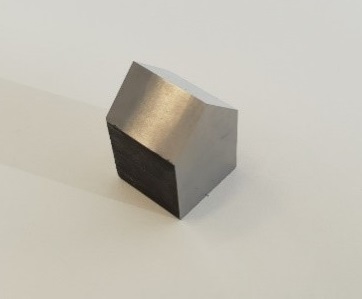 The depth of the cut was determined by slicing the sample open in the plane of the cut and measuring the depth at the centre of the cut with callipers, as shown in Figure 4. Figure 4: Cut belt sample after testing. The cutting tool position throughout the test was determined via optical tracking of markers on the swing arm. The cutting depth and the penetration are not to be confused. A cutting tip penetration of 15 mm into the rubber may only produce a cut of a few millimetres in depth (or no cut at all), because of the elasticity of the rubber. A high-speed camera, recording at 1,000 frames per second was used to achieve sufficient resolution in the tracking of the cutting tool. 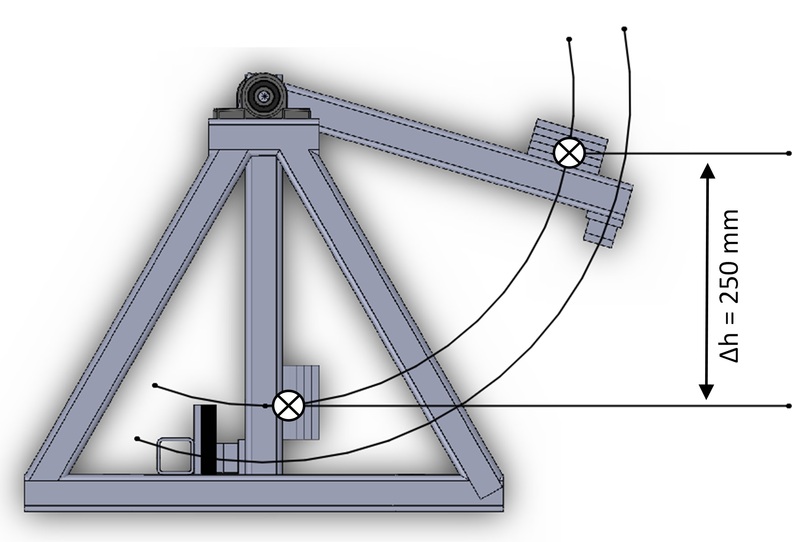 A tracking algorithm was developed in order to analyse the video and compute the cutting tool position in a coordinate system based on the origin of the pendulum. Figure 5 is a plot of the video frame at the time of impact with the rubber sample. Overlayed into this image is the tracker position at all other frames of the complete video of the test. Figure 5: Optical swing arm tracking with high speed camera. The impact energy can be set by manipulating the amount of weight added to the swing arm or by changing the starting height of the swing arm. Eight swing arm heights may be set using the positioning beam. An analysis of the effect of changing the impact energy was performed on selected samples, an excerpt of the results is plotted in Figure 6. It becomes clear, that tool penetration and depth of cut are related but there is a minimum impact energy required to introduce a cut, which is characteristic of the belt material. 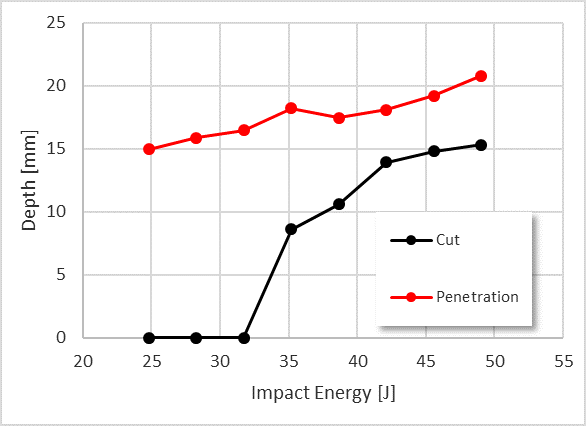 Figure 6: Figure 6: Effect of impact energy on penetration depth and depth of cut. Similarly, the repeatability was investigated on selected samples and found to be satisfactory. Characteristic results for one sample’s cut and gouge resistance as a function of impact energy are plotted in Figure 7. With a standard deviation of 0.4, the coefficient of variation for the tests shown in Figure 7 is 2.8 per cent, indicating good test repeatability. 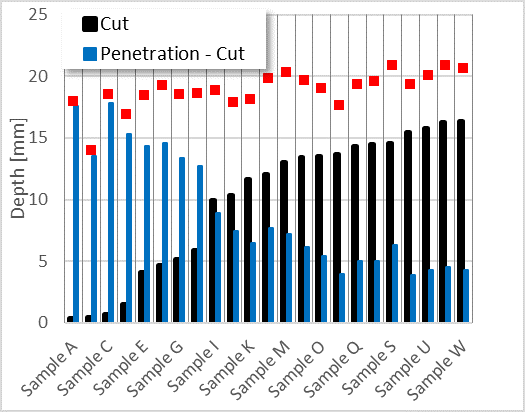 Figure 7: Repeatability of the Cut and Gouge tester. 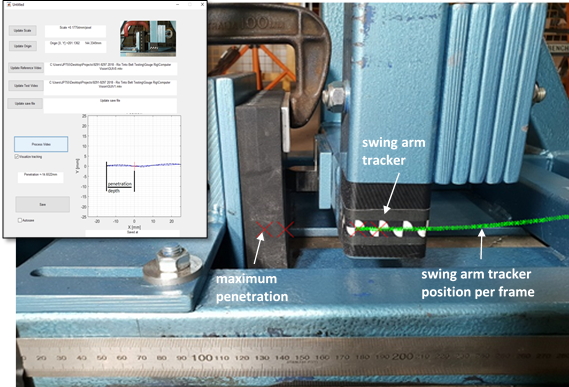 Following the verification of the tester’s performance and the sensitivity analysis regarding input parameters, the impact energy was set to about 50 J with a pendulum height Δh of 250 mm and a pendulum weight of 20 Kg. The results of the comparative testing for samples A to W are shown in Figure 8. 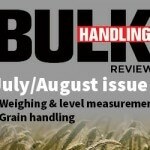 TUNRA Bulk Solids was able to rank the supplied belt samples regarding their cut and gouge resistance with high granularity, providing solid parameters for the client’s commercial decisions. Throughout the course of this project, TUNRA added a custom belt characterisation technique to the range of available conveyor belt tests and expanded the use and knowledge in optical image processing.